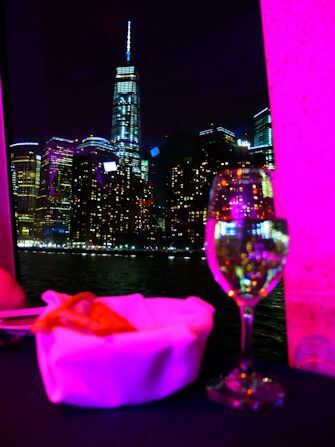 A dinner cruise in New York is the perfect way to end a day of shopping and sightseeing in New York. 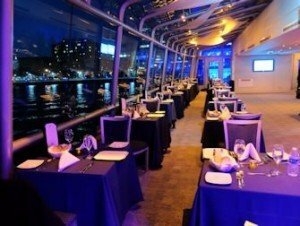 On the New York Dinner Cruise you will enjoy great local food while cruising along the Hudson River. The boat leaves from Pier 40 (take subway line 1 or 2 to Houston Street). The dinner starts with hors d’oeuvres and continues with a three course meal that you’ll be able to choose from an a’la carte menu. You can upgrade to a table by the window with a bottle of sparkling wine if you want to go all out. Once dinner is done, the DJ takes over so head to the dance floor. There’s a bar where you can purchase drinks. Or head outside and take a romantic stroll on the top deck. 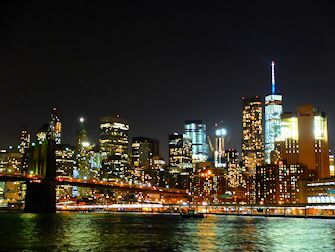 The boat tour travels down the Hudson River, around the tip of Manhattan and takes you right under the Brooklyn Bridge. You’ll see the amazing New York skyline and all the famous buildings such as Empire State Building and One World Trade Center. 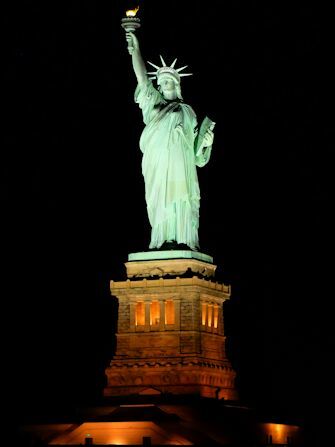 On the way back, the boat will stop in front of the Statue of Liberty long enough so you’ll get your photo moment with her. It’ll be an unforgettable evening. 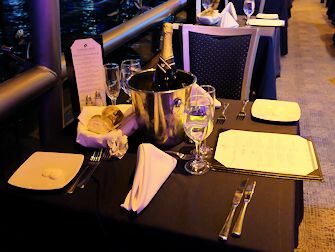 Eric’s Tip: For approximately A$40 per person you can upgrade to a table by the window AND a bottle of sparkling wine. This will be cheaper than ordering a bottle of sparkling wine on the boat and you’ll have a great view so I definitely recommend this. Do dress up though there’s no official dresscode. Children are welcome but I don’t recommend this cruise for children under 12 years.